Toronto residents love to hate the Gardiner Expressway, but any replacement of the highway won't be easy. It is the highway Toronto residents love to hate but have to drive. Was named after the first chair of the former Metro Council, Frederick G. Gardiner, who was a strong advocate for the project. Construction began in 1956. It was built in segments and completed in 1965 at a cost of approximately $103 million. Designed to improve highway access to a fast-growing city, it was built when Toronto’s downtown waterfront was largely a heavy industrial area. The Gardiner carries approximately 200,000 vehicles per day west of the downtown core, and approximately 120,000 vehicles per day east of Jarvis Street. It costs the city $12 million annually for repairs to the Gardiner. The Gardiner Expressway stretches 18 kilometres across the city’s southern edge. More than 200,000 vehicles use the road every weekday, but the six-lane highway is reviled as an ugly, overcrowded artifact of 1950s urban planning. What makes the Gardiner truly ghastly, its critics complain, is the highway’s elevated section between Dufferin Avenue and the Don Valley Parkway. Rising to 30 metres, the Gardiner creates a visual barrier that seals the city off from Lake Ontario. In June, the Gardiner gave new fuel to its critics when a 4.5-kilogram chunk of concrete broke off and fell to Lake Shore Boulevard below. No one was hurt but it raised new questions about the Gardiner's future. There have been dozens of plans put forward over the years to beautify, move and improve the Gardiner. The Glass Tube Architectural designer Peter Michno had a plan to encase the elevated portion of the highway in a curved glass cover to reduce noise, improve the look and reduce maintenance by keeping water off the road. The 'garden' Gardiner Architect Les Klein His plan would add a garden roof over the roadway and include trees, bike paths and a concession stand. The idea is similar to New York's High Line, which turned an unused elevated rail line into a popular green space and bike lane on Manhattan's west side. A new cable bridge Transportation consultant James Alcock wants to see a new elevated highway built just to the north of the Gardiner over the existing rail line. In his plan, created in conjunction with other planners and outlined in extensive detail on his website, Alcock calls for a cable-stayed suspension bridge that could include more traffic lanes and a covered bike path. "I'm in favour of keeping a Gardiner Expressway," he said in an interview. "It doesn’t have to be the one we have now, just as long as we have an expressway there. What I oppose is demolishing it and replacing it with nothing." Bury it Boston chose to re-route an elevated highway underground and streamline other downtown highways in a massive public works project that has become known as the Big Dig. It was marked by cost overruns and ended up costing $14 billion US (the original estimate was $2 billion). The problem with any plan to improve or remove the Gardiner comes down to money. Alcock's plan has a price tag of $1.5 billion to $2 billion. But the city owns the Gardiner, is already struggling with budget issues and is unlikely to scrape together the funds for any grand plans without help from senior levels of government or new revenue sources such as road tolls or new taxes. Even a plan to remove one section of the Gardiner has hit political potholes. It stands as a case study in the difficulty of finding the money to cover any fix. In 2008, Waterfront Toronto — the tri-level government body charged with revitalizing the city's waterfront — began a long and expensive environmental assessment to study taking down a section of the Gardiner between Jarvis Street and the Don River. The idea was to replace the aging elevated highway with a boulevard at ground level. Proponents of the plan admitted it would mean a slower commute but argued removing the Gardiner and opening the downtown core to a recently revitalized lakeshore was worth it. Toronto’s previous mayor, David Miller, was in favour of the plan, which came with a $300-million price tag. But Rob Ford’s election as mayor last fall put the brakes on the Gardiner study. "I hope it's dead," Coun. Denzil Minnan-Wong told the Toronto Star earlier this year. Minnan-Wong, a key Ford ally who now chairs the city's public works committee, said the plan was too expensive. "We’ve got a $270-million repair backlog in our roads," he told the Star. "Tearing down the Gardiner Expressway, an important and vital transportation corridor, doesn’t make sense." Regardless of what becomes of the Gardiner, Toronto taxpayers will continue to face annual maintenance bills conservatively estimated at $12 million to keep the 50-year-old highway in service. City engineer Mike Laidlaw said winter road salt poses a particular problem. It works its way into the concrete. Once there, it causes the steel skeleton inside to rust, expand and crack the concrete. In many sections of the highway, exposed and rust-encrusted sections of the steel structure are visible where the concrete has cracked away. But Laidlaw said city crews inspect the Gardiner regularly to check for loose concrete. In an ongoing project, many of the supporting pillars have been "re-jacketed" in new concrete, leaving them safe and stable for another 30 years or more, said Laidlaw. "We do keep on top of the maintenance," he said. "We inspect all the concrete and monitor it on a regular basis." So how long can this continue? When does the Gardiner arrive at the end of its useful life? "That’s a hard question to answer definitively," said Laidlaw. For many, the Gardiner is only a symptom a larger problem of infrastructure underfunding. 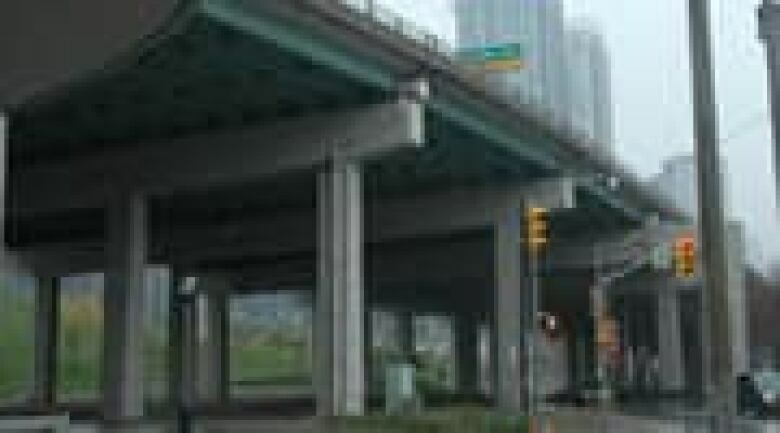 Andy Manahan, executive director of the Residential and Civil Construction Alliance of Ontario, an umbrella group that represents construction unions, says discussion is underway to find new funding sources to cover the cost of replacing aging bridges and highways such as the Gardiner. "The status quo won't cover it," he said. That means some combination of road tolls, higher parking fees or new gas taxes is likely. Though road tolls are often thought of as unpopular, half of Canadians surveyed in an online poll conducted exclusively for CBC News by Leger Marketing said they would be willing to pay road tolls if it would ease gridlock and shorten their commute. So while that debate continues, Toronto residents can count on having the Gardiner grace the city skyline in the near future. In his 1995 book Accidental City, writer Robert Fulford describes how the hated highway came to be and hinted it will likely be with us for decades to come. He called the Gardiner a "1950s planning mistake so horrendous that it may take another century to fix." Summer road closures: Inconvenient or necessary evil?